NYC Manhattan Subway Maps Click to Enlarge; Use Your Back Browser to Come Back. 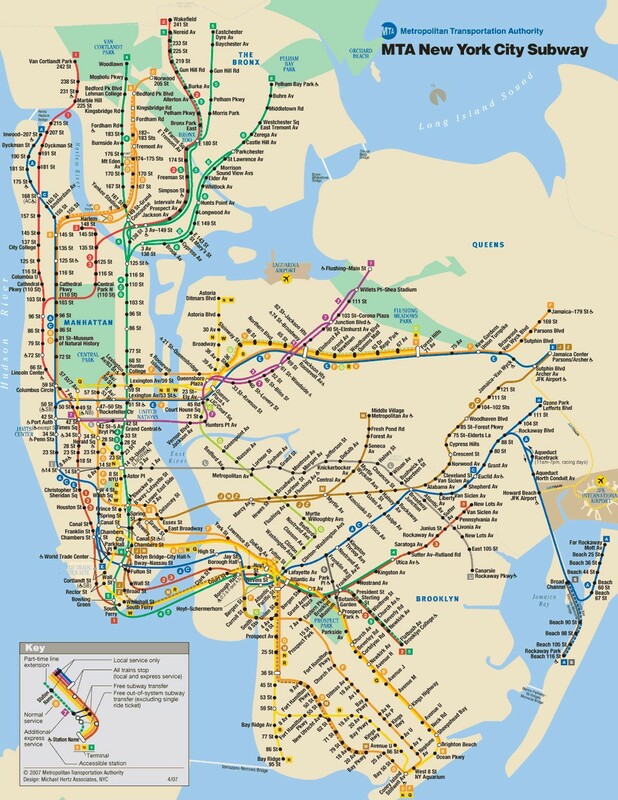 The New York City Subway is a rapid transit system owned by the City of New York and leased to the New York City Transit Authority, a subsidiary agency of the Metropolitan Transportation Authority and also known as MTA New York City Transit. It is one of the oldest and most extensive public transportation systems in the world, with 468 stations in operation (423 if stations connected by transfers are counted as single stations); 209 mi (337 km) of routes, translating into 656 miles (1,056 km) of revenue track; and a total of 842 miles (1,355 km) including non-revenue trackage. 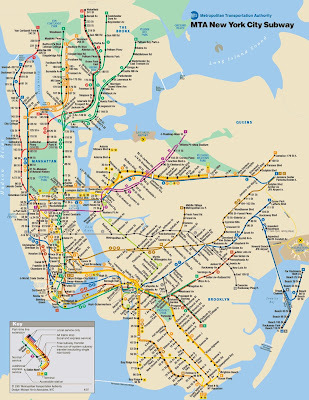 In 2009, the subway delivered over 1.579 billion rides, averaging over five million (5,086,833 rides) on weekdays, 2.9 million on Saturdays, and 2.2 million on Sundays. The New York City Subway is the fifth busiest rapid transit rail system in the world in annual ridership, after Tokyo's, Moscow's, Seoul's and Beijing's rapid transit systems. However it is still the busiest in the Western Hemisphere. It is one of the four systems in the US, along with portions of the Chicago 'L' system, PATH, and PATCO to offer service 24 hours a day, 365 days a year.